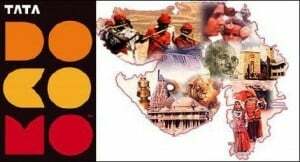 Tata Docomo the GSM mobile service brand of Tata Teleservices is all set to roll out its mobile Service in Gujarat telecom circle.According to the official sources, the operator is geared up for the commercial launch of GSM mobile services by the end of this month. TATA DoCoMo will be the 6th GSM operator in Gujarat, the five other operator are BSNL, Vodafone, Airtel, IDEA Cellular, and Reliance GSM. At present, the company has its GSM mobile service in 15 telecom circle, Andhra Pradesh, Bihar-Jharkhand, Chennai, Tamil Nadu, Karnataka, Orissa, Kerala, Kolkata, Mumbai, Maharashtra-Goa and Madhya Pradesh-Chhatisgarh, Punjab, UP East, UP West, and West Bengal telecom circle. i want to did free talkies with my GF,so,pls launch a better scheme of any other gsm network for me & other DOCOMO couples,,,,,,quick launch sir,plsssssss.